How did an urgent requirement to build a road to Alaska end up helping to design submarines and to recover oil spills in the Arctic ice? The Army Corps of Engineers was faced with a monumental challenge of building a highway to connect the “lower 48” to Alaska during World War II to keep America’s northernmost territory secure from invasion. The road crossed hundreds of miles of wilderness, and much of the roadbed sat up permafrost, presenting challenges to America’s roadbuilders. So a special research facility was created to better understand the cold environment of extreme latitudes, and later to encompass virtually all the challenges of building and maintaining infrastructure along the roads, waterways and territory where temperatures could make life difficult. 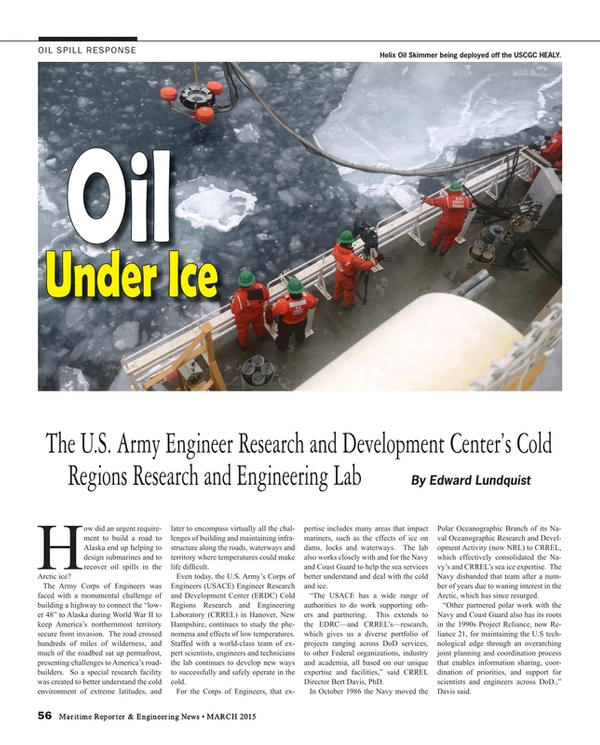 Even today, the U.S. Army’s Corps of Engineers (USACE) Engineer Research and Development Center (ERDC) Cold Regions Research and Engineering Laboratory (CRREL) in Hanover, New Hampshire, continues to study the phenomena and effects of low temperatures. Staffed with a world-class team of expert scientists, engineers and technicians the lab continues to develop new ways to successfully and safely operate in the cold. For the Corps of Engineers, that expertise includes many areas that impact mariners, such as the effects of ice on dams, locks and waterways. The lab also works closely with and for the Navy and Coast Guard to help the sea services better understand and deal with the cold and ice. “The USACE has a wide range of authorities to do work supporting others and partnering. This extends to the EDRC—and CRREL’s—research, which gives us a diverse portfolio of projects ranging across DoD services, to other Federal organizations, industry and academia, all based on our unique expertise and facilities,” said CRREL Director Bert Davis, PhD. In October 1986 the Navy moved the Polar Oceanographic Branch of its Naval Oceanographic Research and Development Activity (now NRL) to CRREL, which effectively consolidated the Navy’s and CRREL’s sea ice expertise. The Navy disbanded that team after a number of years due to waning interest in the Arctic, which has since resurged. “Other partnered polar work with the Navy and Coast Guard also has its roots in the 1990s Project Reliance, now Reliance 21, for maintaining the U.S technological edge through an overarching joint planning and coordination process that enables information sharing, coordination of priorities, and support for scientists and engineers across DoD.,” Davis said. Located in Hanover, N.H., next door to Dartmouth College, the lab has impressive specialized research facilities, including 24 low-temperature research cold rooms with a temperature range down to -35 degrees Celsius; the 73,000 sq. ft. Ice Engineering Facility; and the 27,000 sq. ft. Frost Effects Research Facility. CRREL also has a 133-acre permafrost research special purpose ice test facilities near Fairbanks, including a low temperature materials laboratories and a research permafrost tunnel. The facilities create and duplicate environments for testing and scientifically measure and accurately document test results, which can often be something not possible otherwise. For example, to better understand how ice jams may affect a river, it is possible to build a model, such as the scale model of the jam-prone Cazenovia Creek in West Seneca, NY, built in the lab’s facilities, to enable testing of a low-cost solution to ice jam formation. Recently, CRREL scientists have deployed to Barrow, Alaska, to participate in a field experiments to better understand Arctic Ocean sea ice and snow features using aerial- and ground-based LiDAR (Light Detection and Ranging). CRREL has been involved significant research on how to respond to oil spills in ice-covered waters. The current conventional methods involve drilling holes to expose oil trapped in or under the ice. This hit-or-miss process is costly and labor-intensive. So CRREL has been at the forefront of investigating new ways to find and mitigate oil spills, including under ice detection and the use of different chemical agents to thicken and collect oil so it can be recovered or burned. In order to eliminate the oil by burning it must be thick enough, so “herding” techniques continue to be improved so the oil can be ignited and burned off. While the lab’s scientists are frequent visitors to the Arctic regions, the lab’s engineering facility can replicate a wider variety of conditions than could be found in one place and permit the close observation of the various parameters of the testing. There are many variables, including the extent, type and thickness of the ice; wind, temperature and sea state, not to mention the type of oil. The use of a controlled environment can help narrow down which “proof of concept” testing needs to be done in actual Arctic waters. According to Leonard J. Zabilansky, a CRREL research civil engineer, the CRREL engineering facility can duplicate the full spectrum. In fact, testing can be accomplished with the actual type of oil that might be expected, such as North Slope crude. Researchers from the Woods Hole Oceanographic Institution (WHOI) and the Scottish Association for Marine Science (SAMS) joined with CRREL scientists to evaluate techniques to detect and map oil spills beneath a cover of sea ice. The 2012 studies were sponsored by the Oil Spill Recovery Institute. “The Woods Hole and Scottish researchers used our GRF to experiment with detection of oil from below the ice cover to optimize the sensor suite strategy for deployment on an autonomous underwater vehicle platform for use as an alternative, or as a complement, to methods such as airborne or surface-based methods that may be impractical in some ice environments or weather conditions,” said Zabilansky. The suite of sensors, which includes a black and white camera, color camera, multi-beam sonar, single beam sonar and lasers, were pulled under the ice by means of a trolley, so the sensors could monitor the sea ice as well as the oil located under the surface ice. “Evaluating this technology adds another tool to the responders’ toolbox for protecting the delicate Arctic environment,” said Zabilansky. CRREL has conducted training for oil recovery teams. Although the annual Alaska Clean Seas (ACS) Advanced Oil Spill Response in Ice course training was focused on Trans-Alaska pipeline system, many of the skills can be applied to maritime incidents. The training took advantage of CRREL’s outdoor test basin, the Geophysical Research Facility, a 60 x 25 x 7 ft. concrete, refrigerated in-ground tank, covered with a retractable roof. The training was made possible—and realistic—by injecting North Slope crude oil into and under a 22-inch-thick layer of ice. Sometimes, CRREL expertise is needed practically in their backyard. And sometimes the cold weather can be an advantage. The management of the Missisquoi National Wildlife Refuge (NWR) in Vermont, located on the eastern shore of Lake Champlain at the Canadian border, needed to move some heavy equipment to a remote site on the Missisquoi to protect a Native American cultural site from erosion. They decided to move the construction vehicles and 2,200 ton of rock fill during winter, when the Missisquoi froze over. They could attempt to barge materials over during the warmer months, but the marshy conditions at the site would have caused significant damage, and been more time consuming. So Zabilansky was called in to make sure the ice was thick enough and the conditions safe for ice crossing prior to and during the project. By early January, the river ice cover was 15-17 inches thick. Water was pumped over the “bridge section,” increasing thickness to 21 inches. Over three days, large trucks with oversized tires safely carried the rock and avoided damaging the habitat at the site.